Before we get into today’s post, here is a link to last week’s thinking out loud post. A couple hours after posting I had to put pause on it per a client request, so it didn’t go up again until yesterday. Unless you read it before 10 am you probably missed it, so if you have time, check it out and #speakbeautiful! If you’re new or just stopping in, a big part of my backstory involves being incarcerated for 9 months as a consequence of thefts I made during my time in active addiction. 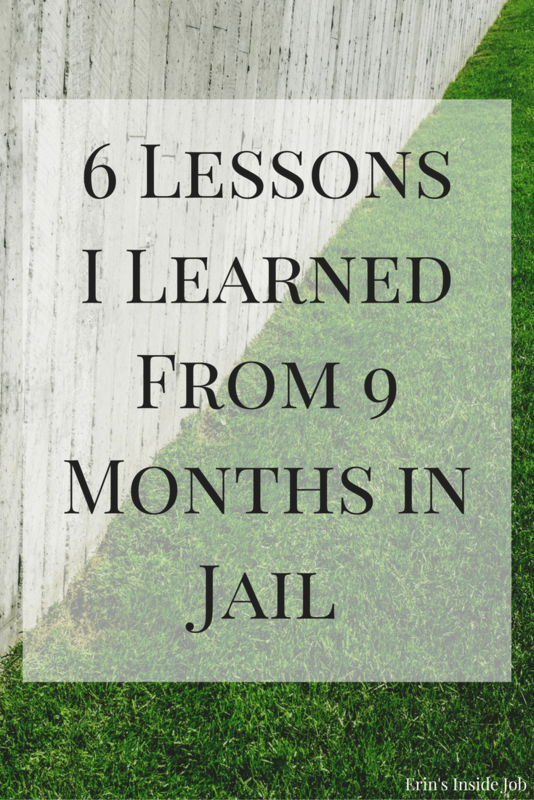 I’ve talked about the events leading up to it and what happened as I started to build my life up again upon my release, but I realized that I haven’t focused much on the time actually in jail. I was originally sentenced to 12 months in jail, but due to good behavior and a reconsideration (where you appear to ask the judge to amend the decision), I was released in 9. I served my time in the local county detention center which was limited in about everything. I almost would have preferred going to a prison where you have the opportunity to be released even sooner and are provided with a lot more to pass the time, but I digress. I wanted this post to be relatable to everyone, so rather than go into detail about the day-to-day process, the focus is more on life lessons that I was able to take away from a negative situation. Growing up, I had a pretty big hoarding problem. That, or I was just too lazy to clean my room (or both). I felt like everything was important and I had a hard time throwing things away even if I didn’t play with them or use them very often. I realized that all the material stuff I had been holding onto as a child and teenager were really just things. I didn’t lose a part of myself by not having toys and knick knacks, in fact, it made me value the few things I actually had. This has made it easier to let go of things as I clean and go through my life today. It’s really easy to look at people in jail and write them off. As soon as I got there I told myself I didn’t belong and all of this was a mistake. After some time, however, I realized that everyone there has their own story and a life that has brought them to that point. Some of the stories I heard were heartbreaking and it caused me to have a more empathetic outlook on others in my everyday interactions. While I was busy judging and setting myself apart from the others in my cell block, I was also failing to accept responsibility for my own actions. Initially, I would think “well yeah, she did drugs and stole, so she’s in jail,” not being able to take the time to realize that that sentence also directly applied to me. Even though I had been in recovery for over 3 months before being sentenced to jail, I still hadn’t accepted responsibility for what I had done. It took being taken away from everyone I cared about for me to stop blaming the cops, the system, and even my workplace for my own behavior. Once I did that, I realized that these were the consequences for what I’d done and began to accept that. Megan wrote a similar post about this recently, and I can attest to the fact that once things get hard, you find out who your real friends are. Initially, I received letters from many people in recovery, but as the months went on and they went about their lives, I began to get fewer and fewer. I don’t harbor any animosity towards those people, and I know it’s hard to keep in touch for so long. The few people I did keep in contact with, however, I still talk to today and I appreciate being there for me during that time. Jail was really boring. Like super boring. We weren’t allowed to have a lot of normal things like nail clippers, razors, pencils, etc. In jail I learned how to thread eyebrows with pieces of string from our jumpsuits and color with deodorant and magazine ads. I’m randomly creative, but this was a whole new level and I loved being able to think outside the box and use things I normally wouldn’t think of to do tasks I normally take for granted. I think most people would agree that jail isn’t the most desirable place to be. The biggest lesson that jail taught me was that every experience is exactly what you perceive it to be. I could look back on that time as a huge waste and almost a whole year of my life gone, but I don’t. It taught me to take negative situations and ask what can be learned from them. What positive can be taken away? If I hadn’t learned this lesson, life would be a whole lot more miserable and a whole lot less productive. The next time life gives you a less-than-ideal situation, stop and ask yourself how you can change your perspective. How can you make it positive? Maybe not in that immediate moment, but how could that event cause you to make changes or improve your life in the future? What lessons have you taken away from negative situations? It is so funny, but your takeaways are so similar to my experience with my back, or when I got really sick with Crohn’s. These are times that make you totally re-evaluate your life. As a result, you change direction. The trouble for so many (myself included), is that there will always be a wind that nips at your heels to take you back to that behavior that you have turned away from, and the greatest strength is to go against it. So many awesome life lessons here and thank you for mentioning my post about friends leaving. its crazy what you learn about yourself and others when things get rough. But I think we’re both better people for what we’ve been through! Absolutely. And you’re a walking machine! A lot of my patients have been incarcerated at one time or another and their stories are definitely very interesting. I think the finding out who your friends are happens in any big life event, good or bad (wedding, kids, death of a parents, etc) and it’s actually one of the best lessons you can learn but it hurts. Wow–its amazing what we can learn from our negative situations, isnt it? Thanks for sharing such a personal thing. What I like most about your blog and your writing is that you put everything out there in an honest way but also in a way that most people (whether theyve been through a similar situation or not) can relate to or apply to their own lives. I think you’re so right about tough times teaching you who your real friends are. That boredom would have been tough. So boring. And super lame books! That’s so awesome that you took away so many good lessons. A lot of these remind me of when I was in Uganda and I got my backpack stolen. I realized that stuff really is just stuff, and I could have so much fun thinking outside of the box when I didn’t have all the stuff I had to begin with. And I think, whenever I was disciplined as a child, I did learn that my sins did have consequences. My parents always did it in love, because they didn’t want me to continue down the wrong path, and I’m thankful that I learned that lesson, even though it was hard. Erin, I just am so thankful that you get us to think and share all the lessons you’ve learned. They really make me think about the things, the hard things that I’ve learned and how much I do appreciate those lessons. 🙂 Your gratefulness is pretty contagious. An thanks so much Emily. What a sweet comment! Erin, this is such an interesting take-away from your time in jail! All of those lessons can apply to us! I didn’t realize all the restrictions they placed on you. During the bad times, I think I’ve learned one big thing: I’ll be fine, and I always make it out okay. That sounds so broad, but I think it’s true. I’m also learning that everyone has a back story as to why they act the way they do – whether I’ve discovered it or not. I love your outlook on this whole experience and recognition into how it’s shaped you into who you are today. great post girl, I feel like we can learn something from every hard situation. When I was in treatment, I definitely learned who my friends were as well. The ones that stick by you through it all are keepers! Absolutely! Glad you made it to the other side as well!! I had no idea you went to jail. Gah. I knew about your addictive past, but I never knew a part of it led you to be incarcerated. Girl, I commend the crap out of you for going through that. Your past has led you to be a very well balanced human being and I love how you’ve taken your past not so great experiences and used them to shape yourself for the future. You have learned and are now a better person because of it. I have a past. I never talk about it. But. I never regret or want to change my past either. Because as I just said, it has shaped who I am as a person and has made me far more grounded and perceptive. This is such an incredible experience.The fact that you can see the upside and positive side to a challenging situation is awesome and just shows you can do anything you want to in life. I’ve had some serious challenges and choose to se the positive things about them as well. It’s awkward sometimes to explain this to people because a lot of people can’t handle wrapping their minds around stuff like this. We are a lot stronger than we think and our experience doesn’t have to define us, and we can choose how we want to learn from everything. Going through my divorce really showed me who my friends are and the ones who stuck by me are the ones I’m still friends with today. Too often we want to put people into the boxes of “good” and “bad” but in reality, we’re all pretty grey. You are incredible. Thank you for opening yourself up and sharing these thoughts + discoveries. Legend. Aw you’re the sweetest. Come back! I saw your post in the link-up and thought it would be just a hook. Kudos to you for going through an experience like that and focusing on the life lessons because a lot of people go through hardship or face the consequences of their actions and just end up bitter. Thanks for sharing such a personal testimony and the lessons you learned from it with us. Aw thank you so much! It’s so important to try and learn from those experiences instead of letting them bring us down. Shared EVERYWHERE. This is such a crazy awesome post, Erin. These lessons can apply to anyone…whether they’ve gone thru the same life experiences or not. THANK YOU for this. Thanks so much for sharing your story so openly, Erin. It’s true – sometimes we need to strip all the fluff and really look at the important stuff. It can happen in different situations for everyone, but the lessons learned are always applicable to life. Absolutely. Thanks for reading san!